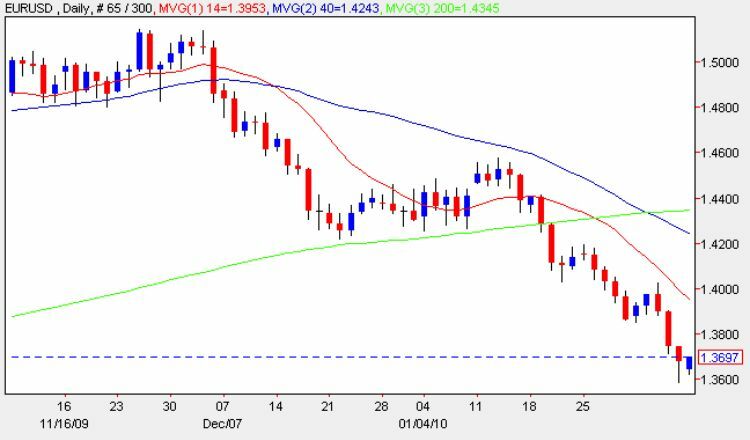 A seminal week for the euro vs dollar which saw the currency pair close on Friday well below the 200 week moving average which further confirms the current bearish sentiment evident on the weekly chart. Moving to the daily chart Friday’s price action ended with a relatively narrow spread down bar but with a deep lower wick, and whilst falling somewhat short of a hammer pattern, nevertheless we can expect to see a small rebound higher for the euro in the short term. Our pivot point calculation for the day at USD1.3669 has been achieved and yielded 20 pips at the time of writing. Whilst we can expect to see this rally provide trading opportunities intra day, the longer term picture remains bearish particularly with the 40 day moving average now crossing below the 200 day and with the 9 day moving average providing solid resistance to any short term move higher any long positions should be treated with extreme caution. The dollar index continues to remain positive in sentiment as the continued buying of the US dollar mirrors ongoing trader and investor fear over sovereign debt, particularly in Greece and Portugal. A very quiet start to the week with no fundamental news either for Europe or the US today and with precious little for the remainder of the week with only Germany GDP on Friday along with the UOM Consumer Sentiment being the main highlights. This lack of fundamental news can result in volatile, random & unpredictable price action as traders and investors look for some direction.